SHOW, SALE & DEMO : Friday, March 29 from 6-8pm, meet Matt Brown! 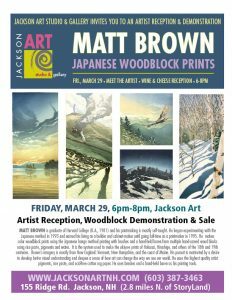 Join us for our opening reception on Friday, March 29 from 6pm-8pm for our show, sale and woodblock printing demo with artist, Matt Brown. Meet the artist and watch him carve his blocks and hand print using the Japanese hanga method. Matt’s imagery is mostly of New England landscapes, with an emphasis on NH and VT lakes and mountains and the Maine coast. The show will continue over the weekend during Matt Brown’s workshop. (currently sold out) Stop by to view his work between 11am-5pm on Saturday & Sunday, March 30 & 31. Free and open to the public. 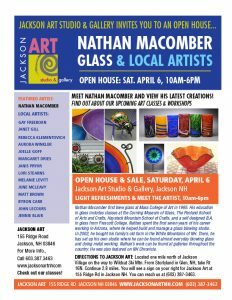 Nathan spent the first seven years of his career working in Prescott, Arizona, where he helped build and manage a glass blowing studio. In the Spring of 2002, he bought his family’s old farm in the White Mountains of New Hampshire. There, he has set up his own private studio where he can be found almost everyday blowing glass, metal working, teaching, or maintaining the hundred year old farm which has been in his family since 1949.